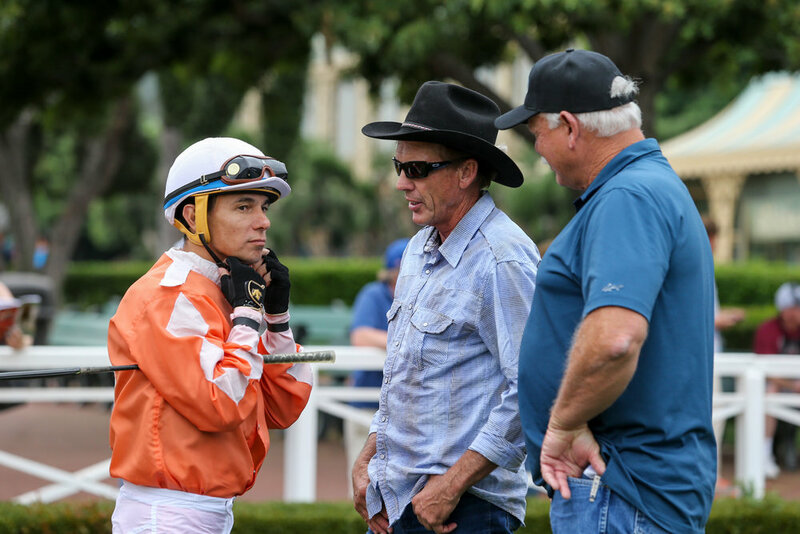 The Santa Anita stable notes for April 14th (as written by Ed Golden) succinctly summarize that Val Brinkerhoff is one of the faceless trainers who drives the game. He might be light years from being in a league with the Bafferts, Browns, and Pletchers but pound for pound, the 62-year-old Brinkerhoff has one of the most industrious operations in the land, flying beneath the radar while gaining respect from peers and bettors alike. He’s an angular version of John Wayne, cowboy hat and all, but without the girth and swagger, Brinkerhoff is a hands-on horseman from dawn till dusk. He is a former jockey who gallops his own horses, be they at Santa Anita, Del Mar, Turf Paradise in Arizona, or his training center in St. George, Utah, where he breaks babies and legs up older horses that have been turned out. In short, Val Brinkerhoff is a man’s man, pilgrim. It all began when he was 14 in a dot on the map called Fillmore, Utah, current population circa 2,500. Named for the 13th President of the United States, Millard Fillmore, it was the capital of Utah from 1851 to 1856. The original Utah Territorial Statehouse building still stands in the central part of the state, 148 miles south of Salt Lake City and 162 miles north of St. George. “My dad trained about 30 horses when we lived in Fillmore,” said Brinkerhoff, a third-generation horseman. “I would ride a pony up and down a dirt road outside our house every day, and that’s how I learned to gallop horses. “There was no veterinarian in Fillmore, so you had to learn how to be a vet on your own, on top of everything else, because it was 300 miles round trip to a vet. So, if something was wrong, you had to figure it out for yourself without having to run to Salt Lake and back every five minutes. “I was 5’ 10’’ and weighed 118 pounds and rode at the smaller venues, mainly in Utah but also Montana, where I was leading rider, and Wyoming and California (Fairplex Park in Pomona). I’ll never forget the day my dad took me to Pomona. I walked in the jocks’ room and immediately became aware of how tall I was. Brinkerhoff also rode in Utah at outposts with names that sound contrived, like Beaver, Richfield, Marysvale, Kanab, Parowan, Ferron, Payson, and Panguitch. “But ultimately,” he said, “I couldn’t make the weight. I was already skinny and at 5-10 and 118 pounds, didn’t have an ounce to lose.